BYE-BYE BURNOUT: With BenQ's lighting technology, our LED panels will give you 50,000 hours of lifespan. That's 8 hours a day, for 17 years! MOOD LIGHTING: The BenQ e-Reading Lamp can easily be switched from warm tones for casual reading, to the cooler tones for concentration and work. With the twist of a knob, you can choose the right lighting suitable for concentration and productivity or for relaxation. ZEROFLICKER TECHNOLOGY: BenQ e-Reading Lamp provides constant and flicker-free illumination and no more unstable lighting to harm your eyes. 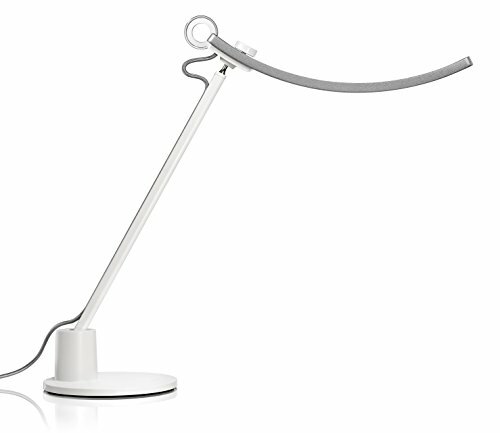 SMART LIGHTING: The BenQ e-Reading lamp has a built-in an ambient sensor. With a longer touch of the control ring, the sensor automatically detects the light levels of the room and adjusts its brightness accordingly. Don't know what is the best lighting for your screen reading? This e-Reading mode will smartly do the job for you. FLEXIBILITY: The BenQ e-Reading Lamp has a ball-joint that optimizes the flexibility of the lamp cap, plus highly durable torque springs and precision friction control to counter-balance the weight. You can adjust the light to the exact angles you need.